Landscape painting has long provided humans with an artistic form for contemplating the relationship between nature, society, and culture. It is a profoundly engaging and intellectually powerful mode of expression that has served a host of purposes over the last 300 years — from buttressing social hierarchy to criticizing injustice to highlighting scientific discovery to expressing human hopes and anxieties. 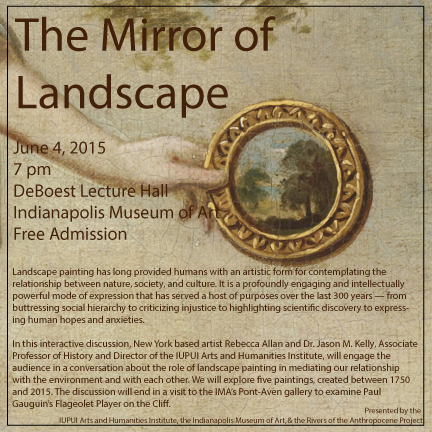 In this interactive discussion, New York based artist Rebecca Allan and Dr. Jason M. Kelly, Associate Professor of History and Director of the IUPUI Arts and Humanities Institute, will engage the audience in a conversation about the role of landscape painting in mediating our relationship with the environment and with each other. We will explore five paintings, created between 1750 and 2015. The discussion will end in a visit to the IMA’s Pont-Aven gallery to examine Paul Gauguin’s Flageolet Player on the Cliff. Presented by the IUPUI Arts and Humanities Institute, the Indianapolis Museum of Art, and the Rivers of the Anthropocene Project.